The opportunity to develop unique takes on any genre has blossomed since virtual reality hit the public market last year. 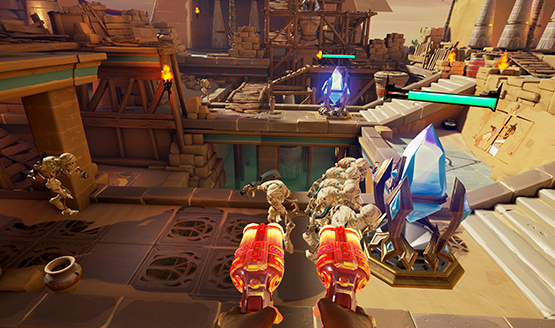 Ancient Amuletor blends a hero shooter with tower defense to bring an under-explored genre to PlayStation VR. Tower defense games have a lot of potential in virtual reality, but with a few small exceptions, we haven’t seen many developers tackle them. In Ancient Amuletor, you don’t build the towers to take on the waves of enemies. You are the towers. Selecting from four different heroes, players warp to different platforms and attack the waves of enemies that come from various directions to destroy crystals that must be defended. There are two hero slots labeled as “Coming Soon,” that will likely be future DLC. Each hero plays quite differently, requiring distinct strategies to use effectively. The gun toting hero is the most traditional, dual wielding pistols that you flick upward to reload. The archer requires you to actually nock the arrow and pull back on the string before letting go of the trigger to fire, needing a little more precision than the gun blasts, but giving greater range. The mage summons orbs from a spellbook and then throws them down at enemies with a magic hook, causing a bit of splash damage where they hit. And finally the puppeteer throws down a metal golem that mimics the moves you make, so you can melee enemies without being in the fray yourself. You can swap heroes on the fly too, so if precision isn’t cutting it, you can become a hero that does a bit more damage to a group of enemies. This is essential for beating levels solo, particularly on harder difficulties. It can become quite a fast paced game of moving to the right platform with the right hero to take down the variety of enemies you’ll be facing. While the gameplay for each hero works quite well and is a lot of fun, I found warping from point to point to often be frustrating, because the forward facing direction was not what I expected it to be. In a fast paced game like this, taking crucial seconds to reorient when you switch towers can mean failure. There was no way that I found to be able to turn from the default on the platform, so you have to deal with whatever direction the developer thinks forward should be. There really should be a way to adjust your forward facing positioning on each tower so that you can better aim at enemies. Ancient Amuletor is a short game. We’re talking less than an hour to run through the games total of four levels kind of short. At launch, the game has two areas, Desert and Empire (which is based on Rome), and each of those areas has two levels. There are two additional locked areas that say “Coming Soon,” potentially doubling the game’s size, but much like the two empty character slots, there’s no word on when these are coming or whether they will be paid or free DLC [Note: According to their Reddit AMA, it seems that they may be planning on making the DLC paid]. It feels like a cheap solution, as if the developer is wants to minimize the fact that at launch there’s not much to do in Ancient Amuletor. There are two boss battles, set as the final wave at the end of each of the two areas. These battles change the dynamic of the game, but it’s a shame there’s not more. It’s again a highlight of how little content Ancient Amuletor has at launch, and I wish there were more of these dynamic aspects to the game to help round things out a little more. There is a bit of replayability through co-op with up to three other players, which is almost necessary. Ancient Amuletor is a tough game, and utilizing strategy and tactics with other players is a great way to mitigate that difficulty. There aren’t any limitations on who can play which character, or even two players being on the same platform, so if everyone wants to play as the mage and stand on a single platform, you can, but it’s much more effective to space out and utilize different heroes for the best strategy. Co-op really is the best way to play, but even that runs thin pretty quickly. It’s the same four levels. The same waves. The same two bosses. That’s the entire game. Oh, I guess you get to shoot a couple enemies during the credits too. There’s an unlockable endless mode for each level, as well as a second, more powerful unlockable weapon for each hero, but it seems to do little more than change what the weapons look like and make them have a stronger attack. It’s also unclear how to unlock these weapons. I played with all of the characters throughout the game, but ended up with only the gunner’s new weapon after I had completed it. It might be that you have to be that particular character when you destroy the second boss, but it would be nice if this kind of stuff was actually communicated in game. It just seems like an afterthought. 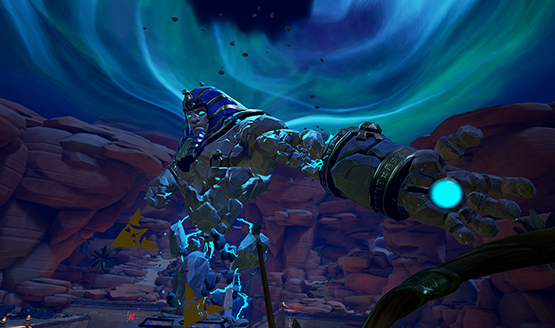 Ancient Amuletor is a fun game that combines two genres in an interesting way in VR. It’s a game that I want to play a lot more, but it just doesn’t have enough to drive return play. Harder difficulties tend to just get more frustrating as enemies take more damage to kill and do more damage to your crystals. I even had a couple of bugs where enemies would become invincible, effectively meaning I would fail the level. You’ll also have to have your hands on two Move controllers for this one, as the DualShock 4 is not supported. There are a lot of good pieces in place here, with the gameplay mechanics and the co-op, but they’ve been packaged in a very scant box that doesn’t do them justice. 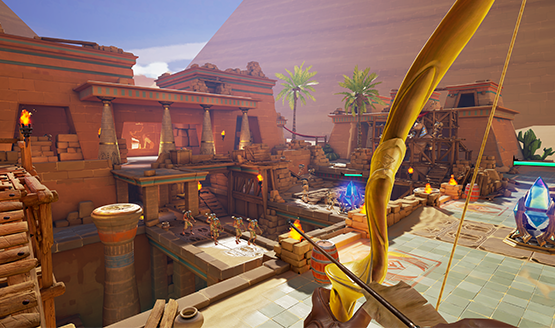 Ancient Amuletor needs to be more than a short PSVR experience that is barely longer than the demo that’s already available for free. Perhaps all of the elusive “Coming Soon” content will fix that, but at launch Ancient Amuletor finds its quiver running out of arrows too soon. Ancient Amuletor review code provided by publisher. Reviewed on PSVR. For more information on scoring, please read our Review Policy.